While Slimjet already provides built-in video downloader which let users download videos from many popular video sites such as youtube, facebook, vimeo, dailymotion, etc, there are still plenty of video websites that are not supported by the video downloader. Therefore, we have added a video recorder to let users record whatever content in the current tab into a local video file. You can use this feature to record a web streaming video, or you can use it to create a tutorial video. To record video from a web page, select "Record video from the current tab" from the browser menu. You can specify a time in HH:MM:SS format to set the video recorder to automatically stop recording after a certain time length. 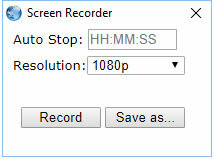 You can use the resolution combo to specify the recording resolution. Click the "Save as" button to specify where to save the recorded video file into a webm file. 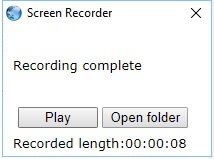 Click the "Record" button and recording will start automatically in three seconds. If you would like the video to be full screen before the recording starts, do it within that three seconds. After that, don't move the mouse so that the playing controls of the video player automatically disappears. You can click the "Play" button to play the recorded video or click the "Open folder" button to manage the video file in Windows Explorer. The file is recorded in webm format. You can play it in Slimjet or any media player that supports webm format, such as VLC Media Player. If you wish to convert the video into some other format like mp4, you can download ffmpeg.